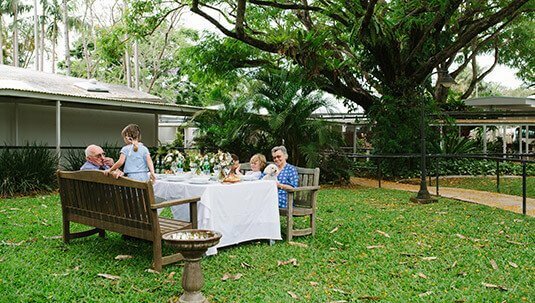 The Cartwright Community, a support unit for people living with Dementia that encourages independence and a life worth living after the diagnosis of dementia. NoosaCare believes that a diagnosis of dementia is no barrier to living a full life. The Dementia Living Model of care has its foundation on the three pillars of Environment, Engagement, and Food. The environment has a significant impact on people living with dementia. NoosaCare strives to maintain a culturally appropriate environment for its residents. Noosa culture is about swimming in the ocean before work and walks along the river in the evenings. Rainforest hikes in Noosa National Park on the weekend, after visiting the local farmers’ markets. People from across the globe retire to Noosa to enjoy the lifestyle. In our Cartwright Community, this means large outdoor areas that represent the surrounding environment of the river, the beach, the rainforest and the rural area. 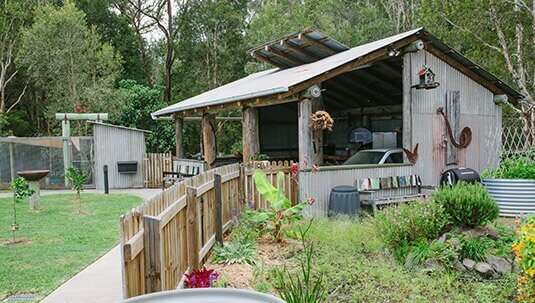 These spaces feature a men’s shed, a chook run, edible gardens, a flowing stream and a contemplation hut. These areas are all designed so that residents can safely access them any time of day they choose. Engagement with family, staff and the community can improve the self-esteem of someone living with dementia by providing a daily purpose. The staff of Cartwright House are specifically selected, to provide on-going Education on Dementia. The idea of doing WITH the resident, not TO the resident ensures it becomes a meaningful place for both residents and staff. Engagement with the Community is encouraged with numerous weekly bus trips around the beautiful Sunshine Coast and through friendships with our large volunteer base. Families are always welcome, with intimate areas inside for visiting family or large outdoor areas for grandchildren to explore. Flexible work routines ensure that staff have time to spend with residents watering the garden or doing indoor activities such as art, dance or music. 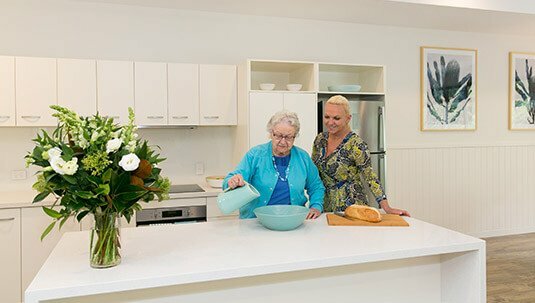 With inspiration from Maggie Beer and her dream to improve the dining experiences of the elderly, the Cartwright community features two well-appointed kitchens where together with volunteers and staff the residents can rediscover the joy of good food. 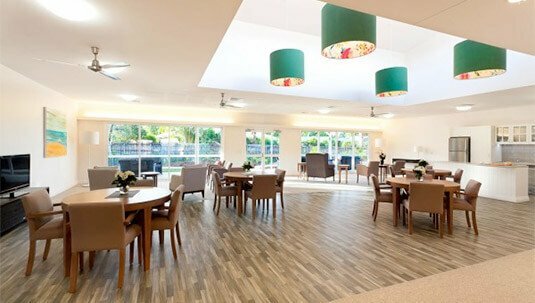 Flexible meal times allow residents a relaxed atmosphere where staff can sit and enjoy a meal with them. Families are always welcome to share a meal in the dining room, or outside on one of the large decks. 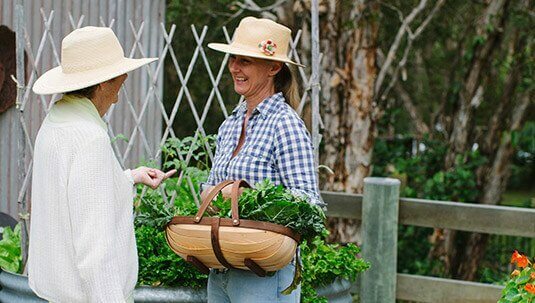 All food at NoosaCare is freshly made from locally sourced produce. Our edible gardens also provide a sense of purpose for our residents, harvesting and sharing the food they have grown. Specially chosen staff have received extensive dementia education and participate in the day to day life of the residents. They share meals together, wash up together, make bread together, laugh, cry and most importantly, they LIVE each day together. 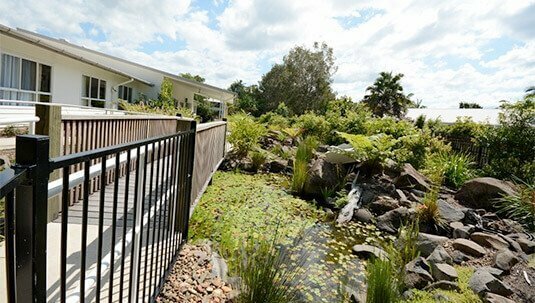 The Staff of Noosacare in partnership with Sunshine Coast University has conducted several research projects which support the DementiaLiving Model of Care. We are also involved at an Executive Level with the Lantern Project through Bond University. 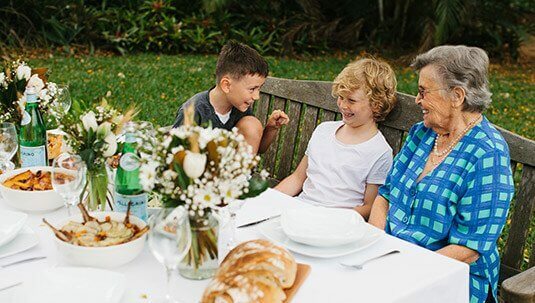 The Lantern Project’s purpose is to shine a light on the issue of food in aged care using old-fashioned quality, local produce, and utilising the wisdom of our older residents. Noosa is world famous for its stunning beaches and lush natural surrounds which has been the influence behind the architecture and furnishings of the Cartwright Community. The building is designed to show our love of the outdoors, capturing natural light with floor to ceiling windows that open out onto expansive patios and gardens. Soft, natural colours and textures adorn the inside rooms and living areas to reflect the Noosa lifestyle. Every single residence with private ensuite looks onto beautifully landscaped gardens providing a peaceful outlook from every room. With uniquely designed landscaping, residents will benefit from unobtrusive security to ensure their wellbeing. A fully functional kitchen provides the opportunity for staff and residents to cook meals together and gather fresh herbs from our therapy gardens just like at home. A wellness room also offers a private space for residents to enjoy massage aromatherapy pamper packages. There is also a private overnight room where loved ones can come and stay during the first few days of a resident’s admission to help with the adjustment. 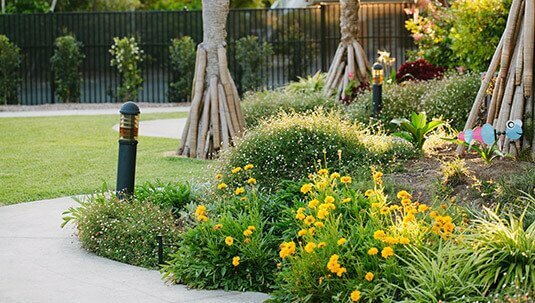 Themed gardens are the highlight of the Cartwright Community, with beautiful meandering walkways that allow residents to wander freely. The design incorporates research from all over the world but brings it back home with our unique design reflecting the Noosa lifestyle. Each sector replicates areas where our residents may have lived or worked in the past, creating a sense of calm and familiarity in their new home. Accustomed to escaping through the enclosures and gates on the farm – Residents can smell, touch and lay in the fresh grass, interact with the chickens, collect their eggs, feed them and gather fresh produce from the sensory gardens. There is a men’s shed complete with tools and farm equipment and of course an old Mercedes Benz for tinkering. Once all the ‘work’ is done there is plenty of patio room to sit back, relax and admire the gardens. The Rainforest provides a cool forest canopy, with dappled light from surrounding trees and vegetation. 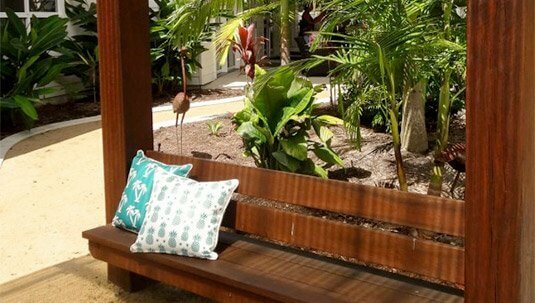 Escape the tropical sun and relax on the timber seat. Residents can enjoy the sounds of the birds playing in the bird bath or just rest amongst the lush trees. Just like the Noosa River, our little version is a favourite spot to enjoy. Listen to the lapping water as it runs over the smooth pebbles and trickles under the timber bridge. 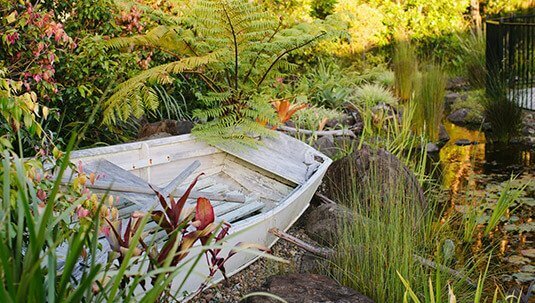 Follow the bank past the lily pads and investigate the rowboat that has washed up on the shore. Something Noosa knows ALL about. Smell the salt in the air, look at the palm trees and walk around the Pandanus trees. 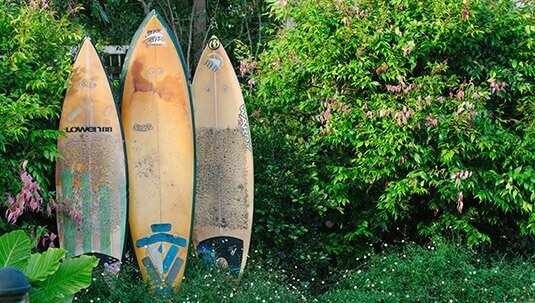 Surfboards can be seen scattered along the paths as Residents take off their shoes and enjoy an early morning stroll. Chill out under the shade of the umbrella and just enjoy the beach life.